Easter Eating. Looking Forward or Dreading it? Easter eating. 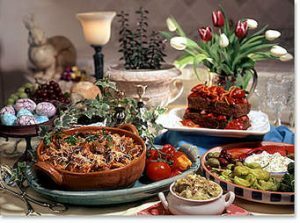 the very thought of it brings excitement as you anticipate the celebratory time with friends, family and food or it makes your stomach churn as you fret about how to navigate the many food laden events. Wouldn’t it be nice to enjoy your life and not have to think/worry about what you will eat? Or perhaps you are obsessing about when you will eat or who you are comfortable eating in front of? If your response to the thoughts about Easter eating are not celebratory-driven you may be struggling with an unhealthy relationship with food. These days our lives are bombarded with talk, advertisements, shows and blogs about diet and fitness. Have you ever wondered why we hear so much about this? Is it because of the ‘obesity epidemic’ or is it because diet and fitness is a multi-billion dollar industry that is purposely creating and reinforcing our insecurities with food, weight and our bodies? Mad face emoticon! I’d like to speak to a few of the biggest concerns that tend to get people focused on dieting and wanting to alter their bodies as quickly as possible. Weight is mostly largely determined by our DNA. Take a look at your family. That is the greatest predictor of what kind of body type you will have and if you are more likely to be thin, average, overweight or obese. Now that doesn’t mean we have no ability to impact this! The key is to understand what we have the most control over and what would be most helpful for us to spend our time and money doing. Here are a few steps you can take that will prove helpful AS you endure and allow a process of change. Get Rid of the Diet Mentality. Diets are proven to not work. This is why many weight loss centres check in with you about 18 – 24 months after your program to see if you have magically regained the weight you lost. They are not being super-caring they are following a repeat business model that works! Eat at the Table. 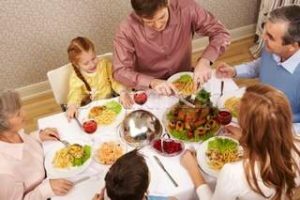 How many people grew up eating at the table as a family?There are many reasons this is helpful. It makes us aware of the task at hand — to fuel our bodies without distraction. If we eat in front of the TV or computer, we are multi-tasking and not as aware of how much we are eating, let alone responding to our fullness cues as we go. Mindless eating is one of the most easily addressed eating problems, it just requires a bit of effort! Eating at the table can also be a good ‘rule’ to follow to prevent mindless eating throughout the day or night. Hungry? Go make a snack or meal and sit down at the table. Enjoyable Movement. Start moving moderately in a way that you enjoy — go for a walk by the river, take dance lessons, go swimming, play with kids/grandkids, join a social team sport (volleyball, badminton, pickleball or soccer), restorative yoga (if you have issues of chronic pain), go hiking, do some stretching and gentle exercises at home, or dance around while you do housework. Most fitness programs are short lived because they are not realistic. We need to find things we like to do (or at least feel neutral about) and start by introducing 1-3x/week. “But that won’t do anything!” If 1-3x/week is more than you are presently doing it is a great start! Then see what is realistic based on your schedule and level of energy. De-Stress! Stress plays havoc on our bodies, minds and spirits. It causes us not to do healthful habits because of apathy or fatigue or plain-old willfulness. Cortisol (the stress hormone) builds up in our system and is very harmful over the long term. Living at a high level of stress is not good for us. Work to lower your stress so that you are not prone to stress-eat and check out. Detaching because of overwhelm is one of the worst things for mindless eating and it keeps us from doing enjoyable movement because of fatigue and/or overwhelm. Why not try something different this Easter season? If you are a person of faith, leverage the aspect of Jesus’ Resurrection. What if you were to put your negative relationship with food and body to death? What if you ‘nailed it to the cross’ and left it there? Perhaps you have made food and your physical body (weight and/or appearance) the priorities you are most consumed by. It’s time to put these things to death and walk in the freedom and fullness of life that God intends for us. Here’s to new life!